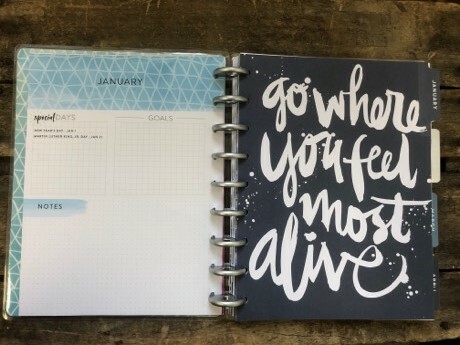 Mandy Joy ♥: 2019 planner. 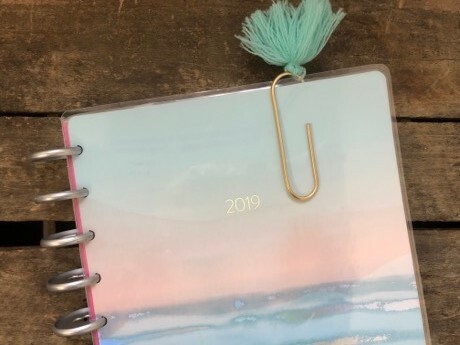 Here is my 2019 planner! It's one of my favorite things to buy every year! 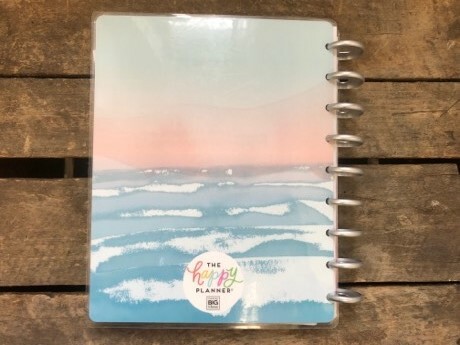 This year I went with the Happy Planner again for the second year in a row. I just love this one so much! The planner itself is thick, but the front cover and back cover are laminated super thick so it can withstand going back and forth with me everyday. The planner is marked for the current week with a giant paper clip I got from a sweet co-worker. It matches the colors on the front cover and some pages inside. 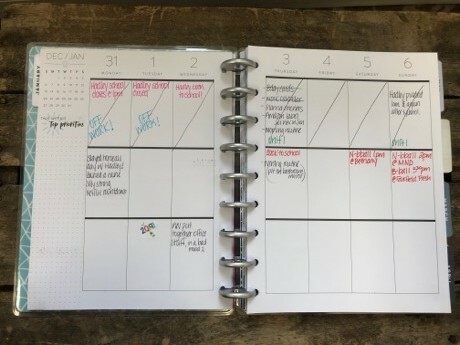 The weekly spread that is broken out into three sections is my favorite. I treat the top as the morning, middle is afternoon, and bottom is the evening. I have a few countdowns this year, so that is what the random numbers are on the top boxes. 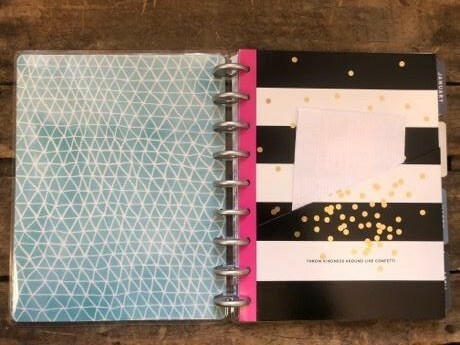 When you first open the planner, I have added a pocket insert page. On the front and back is a little pocket where you can put papers and what not inside. At the beginning of each month is a section to write down goals, notes, or take note of special days. And on the other side, a really cool saying or photo is on the page where the month begins. The next page is the monthly view of each month. I use this area to write down birthdays, bills, and the older kids' schedule. Here is another look at the weekly spread. Some weeks I have stickers on special days, I have a color code system where I write different things in different colors. 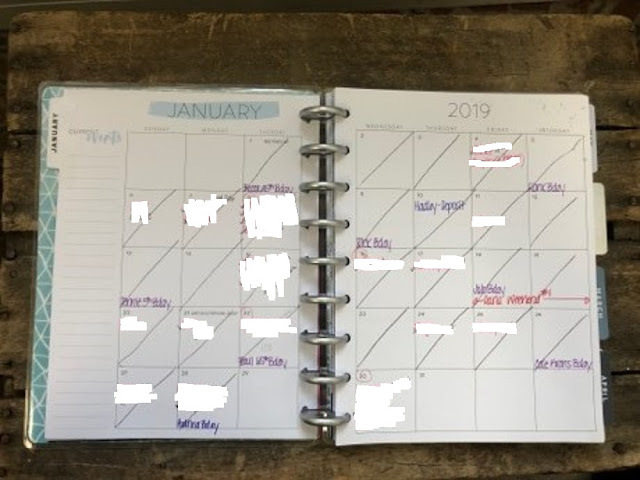 I just started using my personal planner for work this year, since the planner I bought for work had pages printed incorrectly! So instead of buying another one, going to use this one and have it all in one place. For the month of March (my birthday month! ), it has my favorite saying and photo. "Take me to the water." Ahhhhh! The back page looks like this. 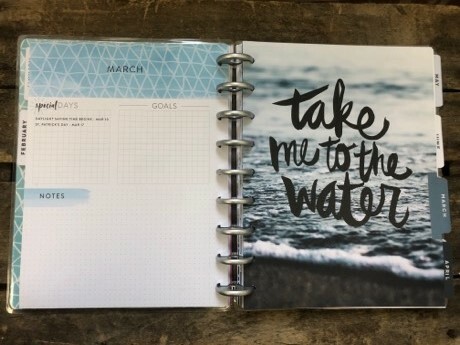 I chose this planner specifically because it reminded me of the calming ocean waters. Have I mentioned the ocean is my favorite? Can't wait to get there this year! 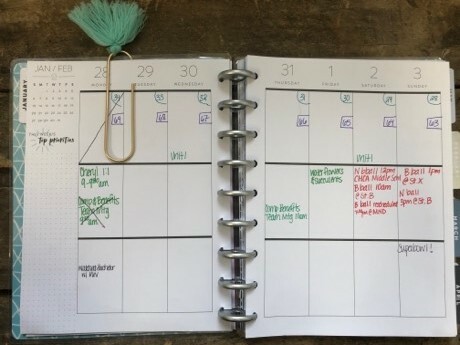 What planners do you use? I love watching other people decorate their planners each week, I strive to do that but don't always get the chance to. It's very inspiring though! copyright 2017-2019 Mandy Joy ♥. All rights reserved.. Simple theme. Powered by Blogger.